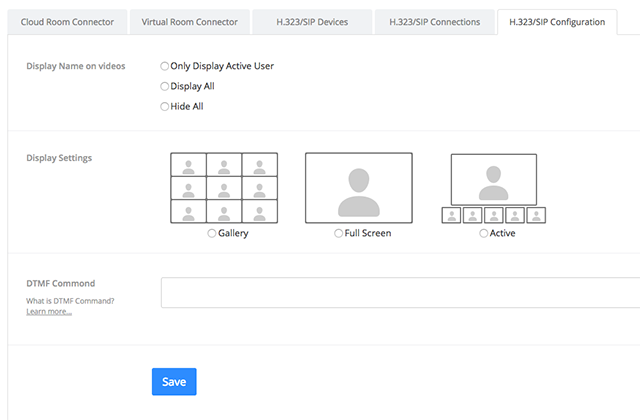 The pre-configurations for H.323/SIP allows account owners and admins to configure the default video layout and input DTMF tones for when H.323 or SIP devices join their meeting via Room Connector. Users will be able to change the video layout or input DTMF tones via the device keypad once joined into a Zoom meeting. Login to your Zoom web portal and navigate to H.323/SIP Room Connector. Click the H.323/SIP Configuration tab. Display Name on Video: Select whether the name of the user displays for all on screen, only for the active speaker, or not at all. Display Settings: Select the default video layout. DTMF Command: Enter a DTMF tone to automatically be sent upon joining the meeting, to choose a particular setting. Read about available DTMF tones.